The city of Dubai, one of the seven United Arab Emirates, is everything the Arab world isn't: a freewheeling capitalist oasis where the market rules and history is swept aside. Until the credit crunch knocked it flat, Dubai was the fastest-growing city in the world, with a roaring economy that outpaced China's while luring more tourists than all of India. It's one of the world's safest places, a stone's throw from its most dangerous. 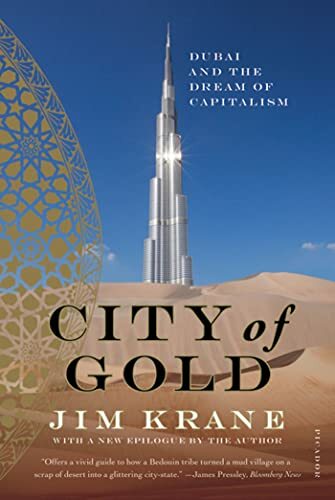 In City of Gold, Jim Krane, who reported for the AP from Dubai, brings us a boots-on-the-ground look at this fascinating place by walking its streets, talking to its business titans, its prostitutes, and the hard-bitten men who built its fanciful skyline. 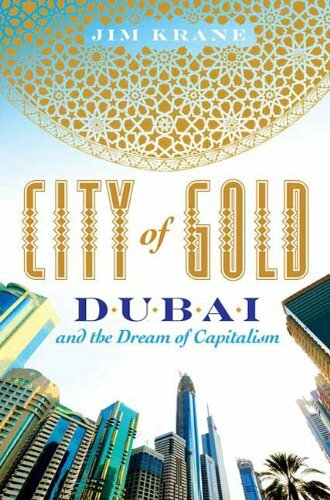 He delves into the city's history, paints an intimate portrait of the ruling Maktoum family, and ponders where the city is headed. Dubai literally came out of nowhere. It was a poor and dusty village in the 1960s. Now it's been transformed into the quintessential metropolis of the future through the vision of clever sheikhs, Western capitalists, and a river of investor money that poured in from around the globe. What has emerged is a tolerant and cosmopolitan city awash in architectural landmarks, luxury resorts, and Disnified kitsch. It's at once home to America's most prestigious companies and universities and a magnet for the Middle East's intelligentsia. Dubai's dream of capitalism has also created a deeply stratified city that is one of the world's worst polluters. Wild growth has clogged its streets and left its citizens a tiny minority in a sea of foreigners. Jim Krane considers all of this and casts a critical eye on the toll that the global economic downturn has taken. While many think Dubai's glory days have passed, insiders like Jim Krane who got to know the city and its creators firsthand realize there's much more to come in the City of Gold, a place that, in just a few years, has made itself known to nearly every person on earth. Jim Krane, an award-winning journalist, was the AP's Persian Gulf Correspondent, responsible for coverage in all six Gulf Arab countries. He has also written about Dubai for The Economist and the Financial Times. Previously, he was an AP Baghdad Correspondent and New York--based business writer. He lives in Cambridge, England, with his wife and son.